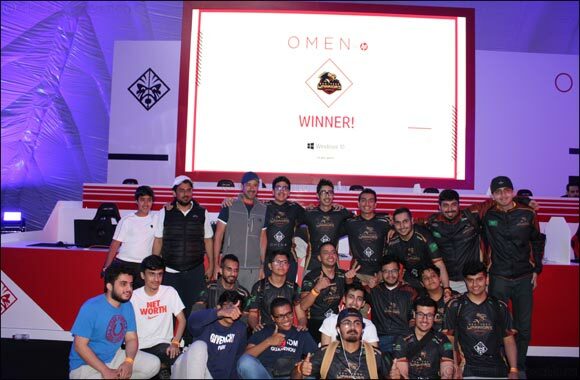 Khobar, Saudi Arabia – April 10, 2019 – For the fourth year running, OMEN by HP was the main sponsor for Gamerscon Saudi Arabia which took place in Khobar between 28-30 March 2019. The event saw gaming enthusiasts from across the Kingdom attend and enjoy various activities. The highlight of the events was the Overwatch championship, powered by OMEN, which pitted eight of the best teams in the Kingdom against each other to compete for the title of this years champions using OMEN 17 laptops. HP sponsored, Osh-Tekk Warriors, came out on top to take first place in a thrilling final match against Team Redemption who came in second. The full OMEN by HP product line-up was present on stage along with a VR gaming experience which put players behind the wheel of an interactive racing simulator offering a thrilling ride to visitors. “OMEN by HP offers a full line-up of products designed specifically to cater to the needs of gamers. We aim to provide professionals, and aspiring professionals, the tools to elevate their game to the next level. With our extensive line-up of products including laptops, PC’s and accessories, OMEN by HP is a natural fit for serious gamers and we hope to continue supporting Gamerscon for years to come” he added. Supported by the General Entertainment Authority, the event has seen increasing attendance in past years. Last year 17,000 guests attended Gamercon compared to 6,000 in 2017. In addition to the Overwatch championship, tournaments were also held for multiple games including FIFA and Tekken attracting the best esports talent from the kingdom and abroad.